• If ABS malfunctions, the wheels can lock during braking. This limits the steerability of the vehicle when braking and the braking distance may increase. There is a risk of accident. • If ESP® malfunctions, the vehicle will not be stabilized if it starts to skid or a wheel starts to spin. There is a risk of accident. The highly flammable gas mixture forms when charging the battery as well as when jumpstarting. • due to friction between clothing and seats • if you push or pull the battery across the carpet or other synthetic materials • if you wipe the battery with a cloth. battery carried out at a qualified specialist workshop. In the exceptional case that it is necessary for you to disconnect the battery yourself, make sure that: • you switch off the engine and remove the SmartKey. On vehicles with KEYLESSGO, ensure that the ignition is switched off. Check that all the indicator lamps in the instrument cluster are off. Otherwise, electronic components, such as the alternator, may be damaged. • the transmission is locked in position P after disconnecting the battery. The vehicle is secured against rolling away. prohibited when handling the battery. Avoid creating sparks. contact with the skin, eyes or clothing. 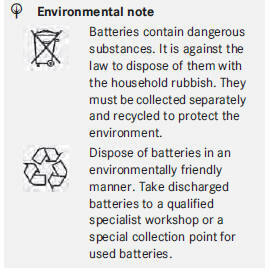 For safety reasons, Mercedes-Benz recommends that you only use batteries which have been tested and approved for your vehicle by Mercedes-Benz. These batteries provide increased impact protection to prevent vehicle occupants from suffering acid burns should the battery be damaged in the event of an accident. Have the battery charge level checked more frequently if you use the vehicle mainly for short trips or if you leave it standing idle for a lengthy period. Consult a qualified specialist workshop if you wish to leave your vehicle parked for a long period of time.